Andrew Breitbart took to his website on Wednesday to attack New York Daily News reporter Aliyah Shahid for writing an article about the cartoon published on Big Government, in which she contacted Breitbart but he declined to comment and referred her to Big Government Editor Michael Flynn. "Whether or not one finds the cartoon funny is certainly subject to debate," Flynn wrote in an email. "But I can't really see how this is controversial to any but those with the frailest disposition." Breitbart saw the article and had a fit. He questions what Shahid learned in "Columbia J School" about contacting people before and after work hours - he was called at 6:56 in the morning - and then he goes off about how she mischaracterized him in her article. Breitbart told the Daily News that he “can’t speak to anything that’s going on right now” because he’s been traveling and has been ill. He referred all questions to Big Government Editor Michael Flynn. In fact I told you I had not seen the “offending” piece, therefore I could not comment on it. You create the false appearance of evasiveness. Now that I have seen the alleged offensive piece, I wonder if you will be able to live longer in a free country where all sorts of things can happen to offend one’s sensibilities. What a tragedy to not live on an über-PC campus anymore. Perhaps there’s another degree you can get to buy another two years of coddling. 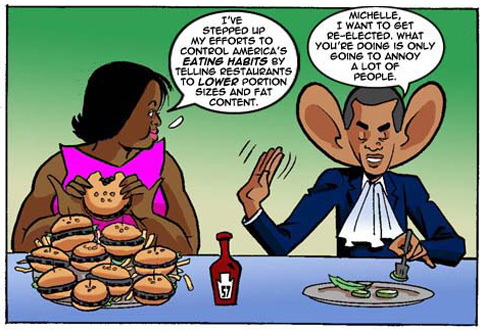 “We find the ‘do as I say, not as I do’ approach of the Obamas hypocritical and ripe for ridicule. The First Lady seeks to enforce healthy eating on the nation, while indulging on snacks in public appearances,” said Lash, pointing to the recent White House Superbowl menu, which included deep-dish pizza and buffalo wings. The headline of your piece editorializes that the First Lady appears “fat” and you project that opinion on to me – as the publisher. 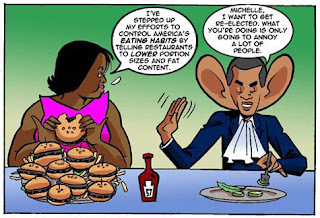 “Andrew Breitbart website posts cartoon of fat First Lady mocking her anti-obesity campaign,” is a shining example of what is desperately wrong with education and the mainstream media. You simply have to invent offenses. And instead of blaming the cartoonist and author, or the editor who okay-ed the running of the innocuous piece, you do the bidding of your ideological cohorts and blame the publisher who has not even seen it. Now that I have, my God sister, you are a familiar pathetic archetype of the modern American newsroom and post-graduate degreed head-case. I hope you find a sanctuary for the pathologically thin-skinned somewhere. Life does indeed get tougher. I find Breitbart's response to be interesting because he is upset that he appears "evasive" because he would not comment on the piece and claimed to be tired and ill, and later he wants blame to be pointed elsewhere, either the cartoonist and author, or the editor, whom Breitbart directed Shahid to in her phone call. It is funny that Breitbart attacks her journalist credentials, complaining about being contacted before work hours, but that didn't stop Breitbart from publishing stories on his website before that featured unconventional methods, such as his heavily edited ACORN videos by James O'Keefe and Hannah Giles or the video mischaracterizing statements made by Shirley Sherrod, and in the latter instance, Breitbart was the one who posted those videos and when people criticized him for purposefully lying, Breitbart shifted the blame to someone else - just like he is doing now with the cartoon and the cartoonist, author, and editor. I also found it funny that Breitbart calls Shahid a "head-case" in his response, but reading her article and his response, it would appear Breitbart is the one who is a "head-case."